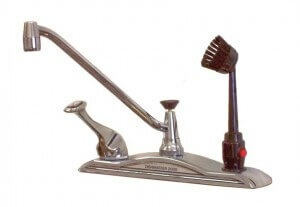 Home » Kitchen Help Category » Faucets » The Dishmaster! 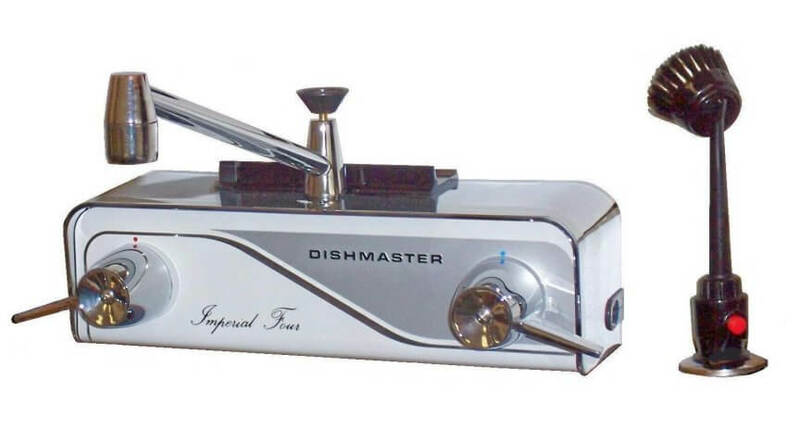 Can you believe – they still make the Dishmaster! 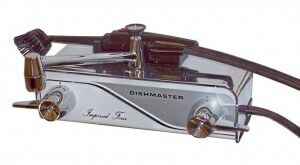 It’s available from the manufacturer — at dishmasterfaucet.com — and also at other retailers. I love this product and its authentic retro style. Make a happy mess in your kitchen – then have some more fun cleaning up. Yes – this faucet makes washing the dishes fun via the “Push Button Dishwashing” action of the special aerator brush wand – which dispenses soapy sudsy water and rinses clean, too. And, it’s Made in America, by a small company right in Indiana that literally came to the rescue to save the brand! Thank you, Silver Stream LLC! There is a third, more mod looking style, above. Well, folks, At long last we have a Dishmaster. When I first went to school I was a ward of the state and got adopted around Thanksgiving time of 1st grade of 1954. These new parents were older than most. ‘Smatter of fact they were about the age of most of my classmates’ grandparents. They were very practical people. 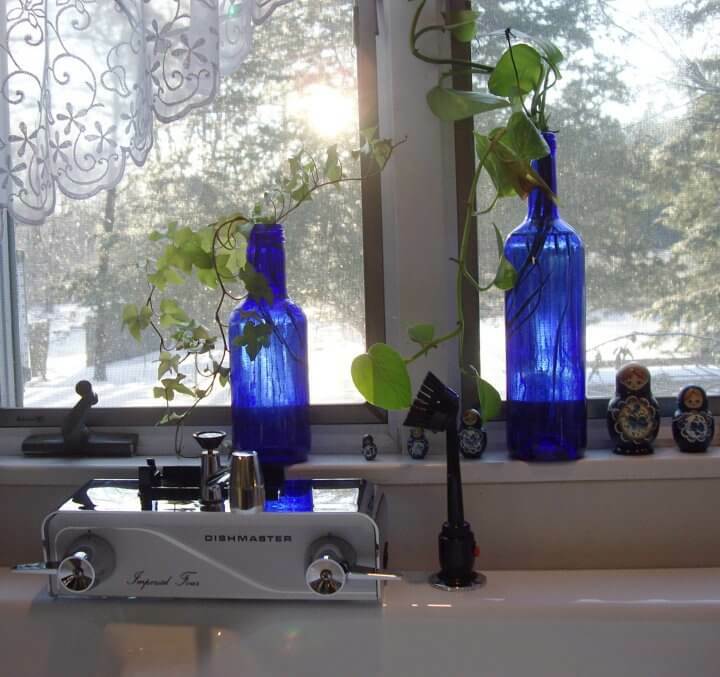 There, at the kitchen sink, was a Dishmaster… All silver and ‘streamlined’. 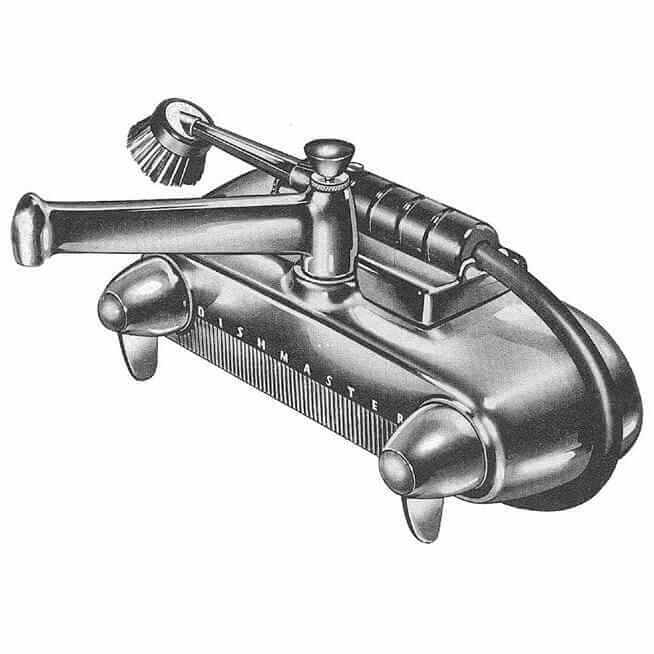 (As soon as the newer model arrived in 1959 the streamlined model was replaced. Among my household chores was the occasional turn at washing the dishes, standing upon a stool, and wanding away. The haus had only a single sink rather than the more ‘modern’ dual sink models. BUT with the Dishmaster, there was no difference in the ritual. Now, at the time we lived in North Atlanta. When at Christmastime, we visited my cousins in Royal Oak, Michigan…. They too had a Dishmaster. Later Visiting my Grandma and my Uncle Ernest, BOTH of them had Dishmasters. I thot that jus’ ‘bout everybuddy had one. Seems that My folks had liked theirs so much that they had made presents of Dishmasters to the relatives but I didn’t know that.. I was so young. I became the “Home & Family; Vest & Garden, Pipe & Fireside” type… even more so after a tour in Viet Nam as a Marine… even if I was an avionics tech. I progressed technically – avionics – fiber optics – electronics – the sciences. My first avionics school was in 1968…. Now I am an experimental flight-line avionics technician. Eventually I had my own home – stateside – after tasking in Europe, New England, jus’ ‘bout all over. At work I deal constantly with what might be considered ‘state-of-the-art’ But at home – – – – we do not consider slaughter as entertainment. Old Tyme radio programme audios are re-broadcast throughout the haus via the ‘Whole House Ipod FM Transmitter’. The living room phone is a Bell 202 (the candelabra phone) while in the Drawing room in the back of the haus is a Bell 302 rotary phone (the I_Love_Lucy phone) from 1939. Our home might be considered an exercise in ‘Creative Anachronism’. > My glasses have round lenses and the wristwatch is daily-wound. I’m even a Public Notary. > The desk is a drop-leaf break-front with authentic working Esterbrook desk fountain pens in the black hemisphere holders. > The living room 3-way pull-chain reading lamp has a paper shade. The davenport is flanked by freestanding ashtrays are from 1943 & step tables illuminated by swing arm 3-way chain pull lamps. > And the kitchen – The toaster is from 1934 – the waffle iron is from 1939 – the Fry-Rite fry-baby is from about 1954. For the rest of the kitchen jewels see the enclosed pictures. And now there is a Dishmaster on the sink. We recently got a Dishmaster and my husband installed it that day. He said that it just didn’t look right. Calling the company again he found out that the front plates from yesteryear are available… They are really expensive because there just aren’t any more. Could you folks get the Dishmaster people to show off the previous front plates and when they were issued? like the older license plates?